Avraham Maimuni's best known work is his Milhamoth ha-Shem ("The Book of the Wars for God"), in which he answers the critics of his father's philosophical doctrines expressed in the Guide for the Perplexed. 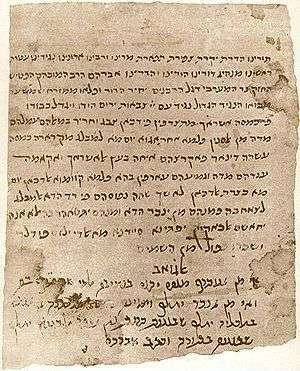 He had initially avoided entering the controversy over his father's writings, however, when he heard of the alleged burning of his father's books in Montpellier in 1235, he compiled Milchamot HaShem which he addressed to the Hachmei Provence. His principal work is originally composed in Judeo-Arabic and entitled "כתאב כפיא אלעאבדין" Kitāb Kifāyah al-`Ābidīn ("A Comprehensive Guide for the Servants of God"). From the extant surviving portion it is conjectured that Maimuni's treatise was three times as long as his father's Guide for the Perplexed. In the book, Maimuni evinces a great appreciation of and affinity for Sufism (Islamic mysticism). Followers of his path continued to foster a Jewish-Sufi form of pietism for at least a century, and he is rightly considered the founder of this pietistic school. ↑ Abraham Maimonides' Wars of the Lord and the Maimonidean controversy, ed. Jacob Israel Dienstag, Fred Rosner - 2000 "His son Abraham stood at his bedside until his father's death when, at the young age of nineteen, he succeeded his father"
↑ Questions & Responsaof Rabbi Avraham, the son of Rambam Archived November 29, 2014, at the Wayback Machine.